Hi everyone...it's Sunday morning here in the northeast. It's cold, raining cats and dogs and the wind is whipping. We went to church last night, so we are in for the day...woo hoo! I am determined to catch up, catch up, catch up. I know you all know that feeling, but I am going to do it today. I'll do a post tonight to let you know how far I've gotten...just putting pressure on myself from the whole world...that ought to get things done. 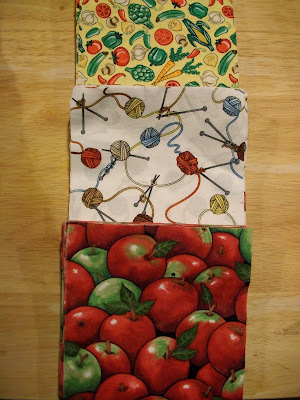 Here's the first thing on my list, sharing the 3 packages of fabric I received this week from our I spy swappers. For some reason on Saturday when I put the memory card in the scanner of the computer, the picture/scanner wizard thingy didn't pop up and let me down load the pictures. It did it earlier this week, not sure why it didn't do it Saturday and it gave me a little trouble this morning. Must not be much of a wizard then! 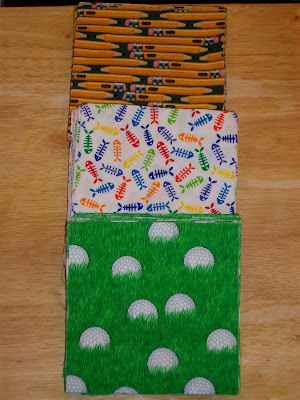 Well, here are the cutest fabrics...I say it every time, but they get better and better, with no duplicates. Don't forget to check below these pictures for links to 2 wonderful blogs I have to share. These are from Elizabeth in Mississippi. and these are from Pokey in California. Thanks ladies for another unbelievable batch of fabrics. Remember the post I did that linked all the swapper's blogs. Well, Lynda from Maine just started one right after that list, so I wanted to share her blog with all of you. The name of Lynda's blog is From My Farmhouse Window. You must go see her beautiful pictures of the fall foliage and of course her beautiful quilts! Go take a peek. Another swapper Lexi from Tea and Crumpets wanted me to share a blog called Craft Hope. From the about page of Craft Hope it explains "Craft Hope is a faith-based, love inspired project designed to share handmade crafts with those less fortunate. It is our hope to combine our love for crafting and desire to help others into a project to make a difference around the world." There are different project happening all the time. The most recent one is "Margaret's Hope Chest". Please go read about it on the Craft Hope's blog, but Margaret's Hope Chest will provide a quilt to homeless children in the Grand Rapids, Michigan Public School System during the Christmas season. The deadline is November 15th, but you may already have a quilt made from your stash that you could send. Thanks for stopping by and now I'm off to start checking things off my "To Do" list.. one of which is a recipe I have to share with you later. Yeah! Still no repeats! I'm getting excited about this! 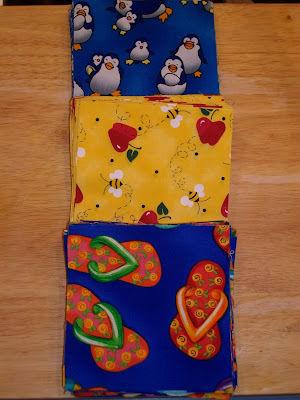 More cute fabrics! I am so happy i sign in! Looking to see your recipe! I REALLY want to put together an I Spy swap. Would you mind sharing with me how you made yours work?